LAST NIGHT, MPs in the House of Commons voted to give themselves greater control of the Brexit process, as it enters its potential endgame. A week may be a long time in politics, but a week in Brexit is something else entirely as the vote last night by MPs comes after weeks and months of political wrangling and upheaval. So, what happened last night? Will it make a difference? Is a deal or a no-deal now more or less likely? What MPs were voting on last night was dubbed the Letwin Amendment, proposed by Conservative former minister Sir Oliver Letwin. His amendment proposed that MPs take control of business in the House of Commons on Wednesday away from Prime Minister Theresa May’s government. This would allow MPs to vote on what type of Brexit it wants, through a series of indicative votes. By 329 votes to 302, MPs voted in favour of the Letwin Amendment. Conservatives were whipped to vote in favour of the government, but the prime minister had 29 rebels within her party voting against the whip. MPs voted to set their own agenda for the House of Commons rather than follow May’s. This is a significant step that had not won enough backing in recent months. But what are indicative votes? So, indicative votes are when MPs aren’t just given one option to vote on – they’re given many of them. For Theresa May’s meaningful votes on her Brexit withdrawal agreement, MPs were given the option of either accepting or rejecting the prime minister’s deal. In the case of indicative votes on Brexit, it’ll mean that MPs can vote on whether they want Theresa May’s deal, a no-deal Brexit, a second referendum, a customs’ union etc. However, this of course also opens the possibility that there is no majority of MPs for any one option. And, furthermore, two opposed stances – such as no-deal and a second referendum – could theoretically have a majority voting in favour of them (although this is of course unlikely). The order in which these options are voted on will make a difference to how MPs sway. If a no-deal is first on the table and MPs rule it out, the rest of the options put to them will be some sort of deal – but is there a majority for any one of them? Similarly, if everything else is ruled out and a no-deal is the last vote – what then? 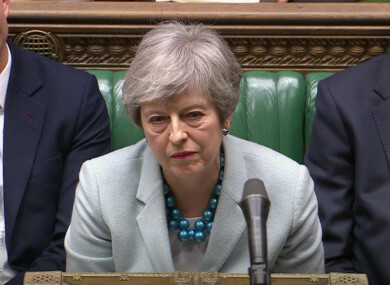 Prime Minister May said herself that she was sceptical of an indicative votes strategy as it could lead to “contradictory outcomes or no outcome at all”. That’s where the narrative of MPs “taking back control” of the Brexit process runs into problems. Indicative votes from MPs in the House of Commons are not binding on the UK government. If, for example, an indicative vote on a second referendum was passed by a majority of MPs, Theresa May is not obliged to hold one. She is free to ignore an indicative vote if she chooses to do so. However, with May under such severe pressure from inside her party, from the opposition and from Europe, it will take an extraordinary feat of political maneuvering to ignore the will of parliament after she specifically blamed MPs last week for not being able to decide anything. With the Brexit impasse dominating for so long, if British MPs finally agreed on some way – any way – forward, the political pressure on Theresa May to follow this will be intense. Even with that, then there’s Europe. Following years of negotiations, the EU agreed a withdrawal agreement with the UK. The House of Commons has rejected it twice and the EU said it is not willing to reopen this agreement. If there is to be a radical change in how Britain says it will leave the EU – as long as it still wants to leave with some sort of deal – then a long delay to Brexit could be likely. What about Theresa May’s deal? May continues to cling to power amidst increasing pressure on her leadership, with the hope that she can still somehow get her withdrawal agreement through parliament. She had originally hoped to hold a third meaningful vote on her deal this week, but told the House of Commons yesterday she currently doesn’t have enough support to pass through parliament. Meanwhile, the DUP continues to remain a roadblock in May’s plans. Hardline Brexiteers had indicated that they would vote for May’s deal if the DUP were happy with it; but the DUP have thus far only called for changes to the backstop in the Withdrawal Agreement, which May flatly ruled out in parliament yesterday. The extension offered by the European Union last week indicates that the UK parliament must offer a new way forward, or else it would leave the EU without a deal on 12 April. If May’s deal passes, the UK would leave the EU on 22 May. With MPs voting to take control of business in the House of Commons tomorrow, the prime minister has little chance of getting her deal through this week. But, the deal has come back from the dead before, and we may not have seen the last of it just yet. Does this make either a deal or a no-deal more likely? Predicting what’ll happen next in Brexit is fraught with difficulty, given how fluidly the situation has changed so often in recent months. The next real indication we’ll get of what kind of Brexit will eventually happen will be following the results of the indicative votes tomorrow in Westminster. MPs voting to set their own agenda does suggest the potential for a majority for a softer Brexit where the UK remains within a customs union, and that’ll be made clearer tomorrow. But what actually happens there could make the situation no clearer – if there’s no majority for anything and with the potential for May to simply ignore the results. One thing is clear – after the short extension granted to the UK, it only has two weeks to decide what its next steps are. As is always the case with Brexit, time is running out. Email “Explainer: Indicative votes ahead as MPs 'take back control' - but will it make a difference to Brexit?”. Feedback on “Explainer: Indicative votes ahead as MPs 'take back control' - but will it make a difference to Brexit?”.